Scott Brinker, President & CTO, ion interactive, inc.
Gord Hotchkiss says that building this panel was a piece of cake. All the presentations create a logical progression through the topic. This session is about what happens after a user clicks on a search engine result. 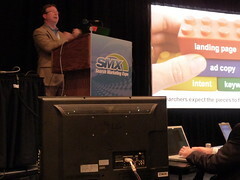 He asks who in the audience spends at least a quarter of their time optimizing post-click. Let’s not forget about that aspect of site optimization, and this session’s going to help us figure out how to take action in optimizing the post-click. With the competition just a click away, it’s important to use all the tools at our disposal to be as successful as possible. Usability is about helping site visitors accomplish their goals. Usability testing for conversion optimization can range from guerilla techniques to full lab environments. Identification of user experience and site usability issues. Recommendations to resolve identified issues. Aids in the prioritization of product development direction. Is the menu-naming terminology consistent with the user’s perspective? Use card sorting to validate your IA. Prototype testing is the process of putting together a working model in order to test it. Start usability testing as early in the project as possible. Any usability testing is better than none. Usability for optimization is not a one-time activity. Revisit it as often as necessary. 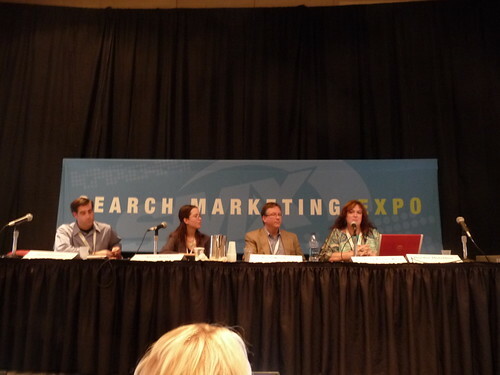 Alissa Ruehl says that it really depends how you can improve your conversion rate. Every site is a unique and special snowflake, and has unique and special problems. You have to understand your problems before you can fix them. Fortunately, you’re probably using an analytics program that tells you how your users are interacting with your site. What is the purpose of your site? Web lead, sales, phone calls, store visits, engagement and awareness, distributing info — more than likely a combo of all the above, with different values for each. You’ll want to consider if you’re supposed to optimize ALL of your goals, not one at the expense of the other. For e-commerce, start with the purchase process. Are people abandoning at the shopping cart? Do some testing if you think so. Although, you’ll want to be careful when testing your shopping cart. Breaking it means no conversions means no fun. Move on to the entry pages if the purchase process is solid. Where are you sending your traffic? If you’re sending them to the home page, test the home page. IF you’ve got a lot of PPC traffic, look at what landing pages you may want to develop. Also look at navigation paths for categories. Focus on your biggest problem areas first. Use a tactic that fits the issue (page testing, usability testing, focus groups, surveys, complete redesign, etc.). Lead generation: Are all leads created equal? If all leads aren’t created equal, take a look at the down-funnel data. Instead of focusing only on Web forms you could track past the lead and analyze and optimize toward human scrubbed leads, qualified opportunities, sales, etc. In a couple of years, tracking only leads will sound as silly as tracking only clicks today. What do people do when they enter your site? It never hurts to focus on your forms. It’s often people’s lowest-hanging fruit. Dig deep to understand and optimize towards your end goals. Use your analytics to find your unique problems. Tailor therapy to the type of problem. Look at level of difficulty compared to level of impact. Kim Krause Berg has a broad approach to usability and accessibility online. She says that she’s going to start off on a boring note, but she often finds that it’s an overlooked task: business requirements gathering. What are site requirements? Defining what goals different departments want to get out of the site. It’s getting your ducks in a row before starting. It’s difficult to convert traffic to sales when you haven’t figured what your site is expected to do and who will use it. When you’re doing this, write everything down, have teams sign off, and create test cases and guidelines. BR2. Provide information on our company. BR3. Provide excellent customer service. BR4. Be accessible to everyone. The above lists the “parent” requirements, which aid in the development of information architecture. The above lists examples and may sound tedious — they are. These requirements refer to technical issues. Derived from use cases, mental models, user personas. Determine specs for browsers, OS, accessibility, bandwidth, performance, platform, mobile use, programming. All “children’s requirements” — functional requirements (FR), usability and accessibility requirements (UAR), search engine requirements (SER), user interface requirements (UIR), social media requirements (SMR) — MUST to be traceable to business requirements. Scott Brinker will be taking us on a different path — landing page usefulness. Option A: Technology and psychology to optimize them to convert. Option A is usually 20 percent of the goal, but gets 80 percent of the attention. There’s a fable about a man, a boy and a donkey. The moral of the story is that if you try to please everyone, you’ll please no one. But here’s Scott’s take. The donkey was the problem. You can please everyone, you just need enough donkeys. Google has made us impatient. People expect on-demand info. Searchers expect the landing page, ad copy and their intent to match. But a lot of the time, there’s a break down. You want someone to click on a search result and get exactly what they wanted. This means dozens, possible hundreds of landing pages! Sometimes companies have hang-ups over creating landing pages. Look at special events that may have significance for your market. iRobot created custom landing pages for Father’s Day. It took a day to create the campaign. He can’t share with us the results, but we can assume is was worth it. Test-driven marketing: Controlled experiments to discover what people really want. This can help marketers become less risk averse. With quick feedback, you can take bold ideas and run small, controlled tests to know if it could work on a larger scale. Test small, and safe. It’s not about the number tests, it’s about what visitors are looking for and how can you give it to them. That’s what landing page usefulness is all about.